It is hard enough to be a teenager without the stress of worrying about shelter and food. That stress was very real for these Toussaint graduates who now are doing great things in their lives after the Village. At sixteen years old, Marco came to Toussaint Academy far behind in school credits. James arrived after his parents were deported. Jessica had been living on the street. Their lives are very different today. Each of these teens and so many more arrive at Toussaint with challenges far beyond their years. With a little help, guidance and love, each of them is on a path toward pursuing their dreams. Read more about what they are doing today. Marco was far behind in school credits due to poor attendance – nobody cared if he showed up for school. After enrolling at Toussaint Academy, Marco entered Garfield High School and maintained nearly perfect attendance and a 4.0 GPA. Garfield High recognized Marco with awards for both attendance and academic achievement. Marco is now a high school graduate, is employed and attending college full-time. After James’ parents were deported to Guatemala, he had no place to call home. His high school referred him to Toussaint Academy where education became his top priority. James graduated high school and enrolled in City College. His 3.4 GPA earned him an academic scholarship. At sixteen years old, Jessica was living on the street, doing drugs and blanketing her community in graffiti. Once at Toussaint, Jessica was determined to focus on college as a way to better her life. Instead of illegal artwork, Jessica channeled her creativity to help others use art as a forum to cope with their stress and worries. Jessica graduated high school with numerous scholarships and job offers. She now attends California State University, Sacramento majoring in Interior Design and Architecture. Born in Mexico, Aaron had trouble becoming a citizen due to his mother’s battle with drug use. Aaron came to Toussaint Academy at sixteen, where caseworkers helped recover the documents necessary for citizenship. 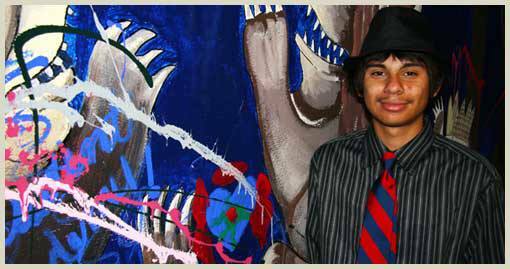 Now eighteen and employed, Aaron has applied for college and gained acceptance to two schools. Stephen was referred to Toussaint Academy at fourteen years old. Prior to moving into the dorms at Toussaint, Stephen had only attended seven days of school during the entire year. Today he has dramatically improved his attendance and his grades. He is involved in ROTC and plans to attend college in the future. Many of us can relate to the trails and tribulations of the teenage years, but fewer of us can imagine what those years would be like with the added stress of sleeping on the streets or spending days without a meal. By supporting Toussaint Academy, you can help provide peace of mind for San Diego’s homeless youth.